The Royals line-up has been crushed by injuries this year, with Alex Gordon and Lorenzo Cain both spending chunks of time on the DL, and Mike Moustakas lost for the season due to a torn ACL. Today, the injury bug is apparently moving over to the pitching side of things too. Wade Davis is going on the disabled list with a right forearm strain. Brooks Pounders is being called up. On a superficial level, Davis has seemed fine this year, running a 1.23 ERA and converting 19 of 21 save opportunities. But this news probably shouldn’t come as a huge surprise, because there have been some lingering red flags for a while now. Davis struck out just seven of the 40 batters he faced in June, a remarkably low total for a guy who has been one of the most dominant relievers in baseball for the last few years. Interestingly, though, the other traditional red flag associated with pitcher injuries — velocity decline — has actually not been an issue for Davis. In fact, his velo has been trending up all season. Of course, the upwards trend is mostly him getting back to where he threw the last few years, as his velocity was down a lot in April and May, so velocity decline was an issue earlier. It’s a bit odd that his strikeouts are disappearing at the same time his velocity is coming back, but given the existence of both issues within the first four months, the fact that he’s headed to the DL makes plenty of sense. For the Royals, this is a pretty big loss, as Davis has been the anchor of their bullpen, which is really the only thing keeping them in contention at this point. The team has had the worst starting rotation in the AL this season, and their offense isn’t anything special. Without Davis, the team will likely have to shift Kelvin Herrera into the closer role, weakening the team’s middle relief significantly, and they might have a tough time winning as many close games as they have become accustomed to. 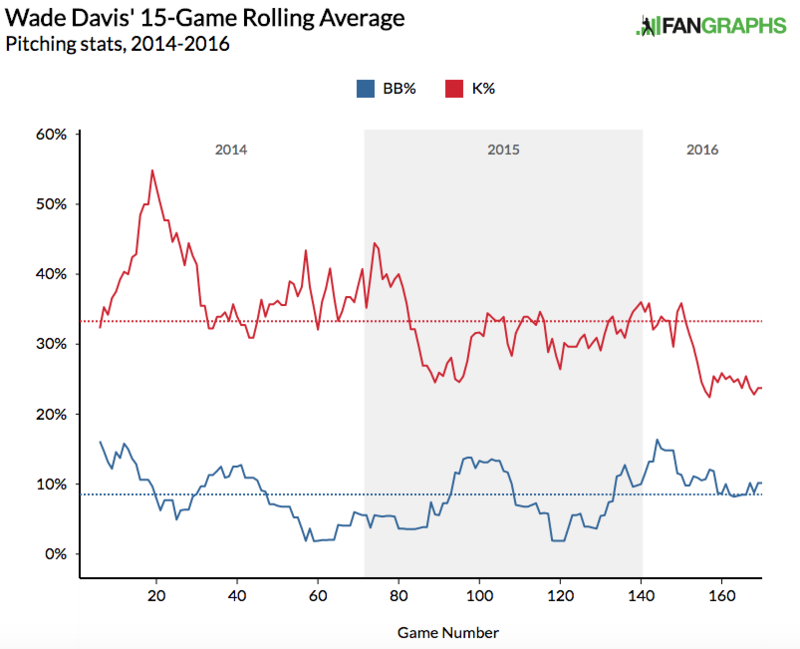 Given that the All-Star break is coming up, it is possible that the Royals are just using this timing to give Davis a bit of an extended break — this keeps him from going to San Diego, after all — and perhaps the issue won’t be a long-term concern. But forearm tightness is often a precursor to Tommy John surgery, and if the Royals lose Davis for an extended period, it will be a big blow to their chances to get back to the postseason. 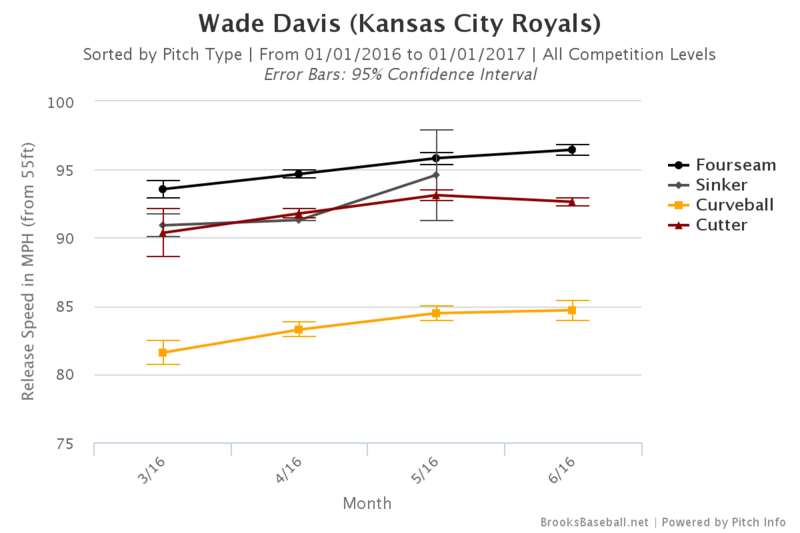 We hoped you liked reading Wade Davis Is Going on the Disabled List by Dave Cameron! I don’t know, sounds more like a #2/#3 than a #1 name to me. If the whole baseball thing doesn’t work out, he could always open up a brewery.